Namine had a great time at the Milwaukee Ballet Tour de Force kickoff party. Last November, Namine was accepted into an inclusive program initiated by the Milwaukee Ballet called Tour de Force. 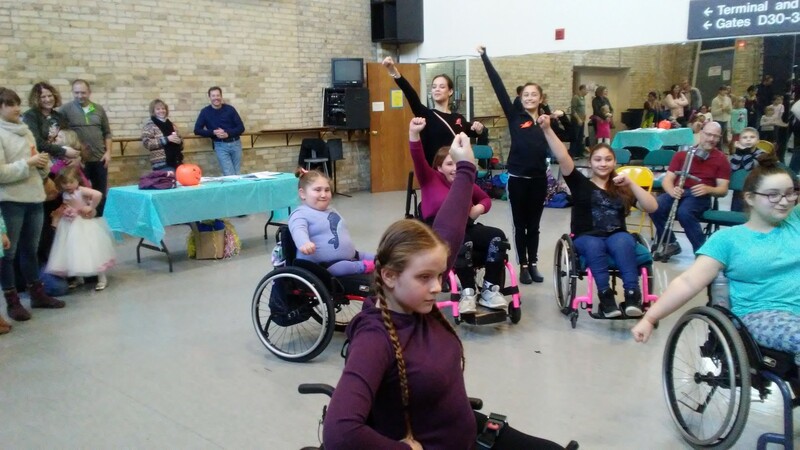 It’s a five-week session of ballet classes, ending in a recital, allowing children with special needs to participate in dance classes with professional dancers. The kickoff party was a show, in which the very dancers who’d be teaching the children performed. In the finale, they invited the children up to participate in the final number. It was way too crowded to get Namine’s beast of a wheelchair up there, but she was able to get in on the dancing. Namine is on the left. After the performance, the Tour de Force families were gathered together for snacks, introductions, and a group dance. The children were split into groups, where they came up with their own dance moves. The actual Tour de Force classes don’t start until next month, which gives us just enough time to go on vacation. When we get back, Namine will be able to ditch the wrist brace and resume normal activity, including basketball, piano, and dance.